Honestly, I’m quite lucky. 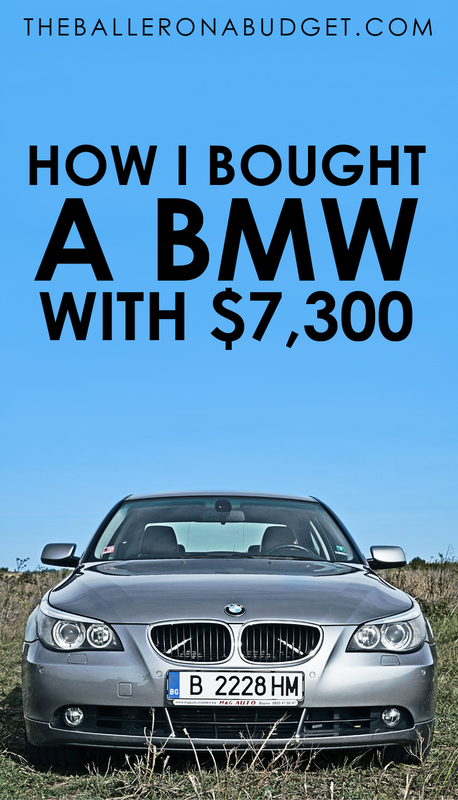 I drive a 330i BMW and it’s fully paid off. I don’t have to worry about monthly car payments, and I only pay for my car insurance twice a year for a 6-month policy (this saves me more money paying upfront). The only thing I pay for on a fairly regular basis is gas. What confuses a lot of people with the car that I own is that it’s considered a luxury sports car, and considering my financial situation, it doesn’t make sense how I was able to afford it. I’m just your average joe. I’ve worked minimum wage jobs and I live paycheck-to-paycheck, just like everybody else. I didn’t sell drugs to come up with the cash, nor do I have a sugar daddy who pays for it. I proudly own my 330i with a clear title and a pink slip in hand. I used to drive a 2001 Honda Civic, but wound up giving it to my parents because they needed a second car. I loved the Civic – 30MPG, and about $30 for a full tank of gas. But I desired more for myself. I wanted a huge upgrade. I saved up about $10,000, and decided it was time to go car hunting. I did extensive research on what car I liked, but I was only looking at Hondas or Toyotas. I thought to myself: with the budget I had, I could buy a reliable Civic or Corolla in $10,000 cash off of Craigslist. I wanted to be practical and buy something that was gas-efficient and not too high on mileage, but performance-wise and visually, I wasn’t satisfied. After a few months of searching, I finally found my car. I drove some 90 miles with my boyfriend to buy it, and it just needed a good detail and some minor cosmetic work, but it ran perfectly well. 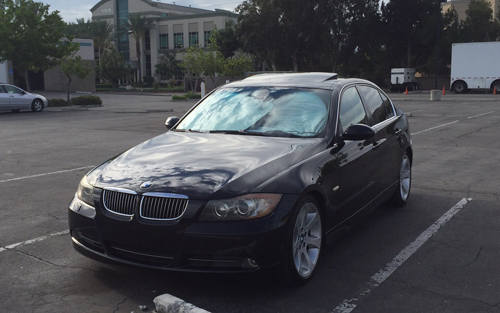 That day I walked away with a 2006 BMW 330i, fully loaded with features and add-ons like GPS navigation, sport suspension, heated leather seats, and privacy curtains on each window, including the rear windshield. My 2006 BMW 330i. Isn’t she pretty? 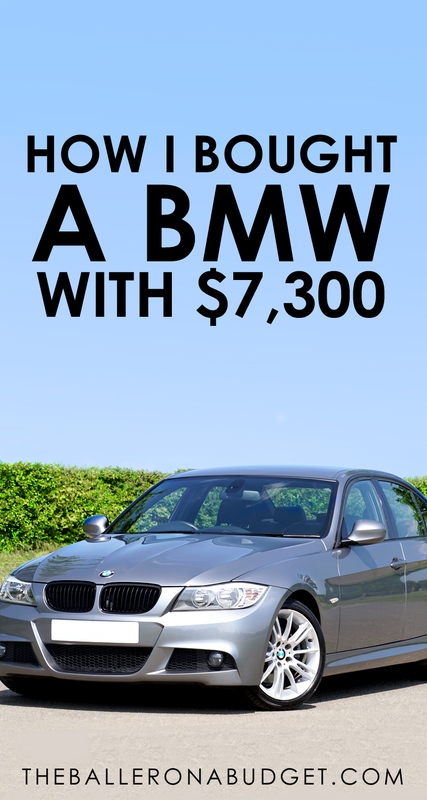 Over time, we’ve bought several BMWs in cash. Aside from my car we’ve also got a 745Li, 545i, and a 335i convertible sitting on our driveway. All of these cars as well as my 330i were bought within the last 2 years, and no, we aren’t struggling to make ends meet because of our car purchases. We snagged some great cars in excellent condition, and at even better prices! Continue reading to see my tips for making the best pre-owned vehicle purchase. People go to dealerships to make a purchase that comes with peace of mind. When you purchase a pre-owned vehicle from a dealership, you’re trusting that they did all of the necessary maintenance and major fixes before selling the vehicle to you. However, like many people already know, dealerships have a bad reputation for a reason. I used to work in the service department of a dealership, so I personally witnessed and know how much human error there can be when it comes to fixing cars. Even worse – if they had a vehicle that wasn’t the brand of the dealership, the repairs were more than questionable. For example: if a Honda dealership has a Jeep for sale, the Honda-certified technicians of that dealership will still work on that Jeep, unless the owner decides to have the Jeep serviced at a Jeep dealership. Most of the time, they do the service in-house to save money. Whether or not those Honda technicians have sufficient experience with Jeeps, we as consumers won’t truly know. Dealerships also purchase vehicles from private owners or auctions, meaning they purchase these cars at a very low price and keep repair costs as low as possible in order to create a significant profit margin for them. This means they could possibly skimp out on parts or repairs. Does that sound like quality to you? Not only are you taking that risk through a business that is supposed to guarantee a sound purchase, but dealerships also ask way too much for pre-owned cars and leave little room for negotiation. $10,000 may not get you much compared to what it could potentially get you in a private sale. So many good things happen when you buy in cash. 1: The car is already paid off when you buy it. 2: You don’t have to worry about getting approved for a car loan, and your FICO score remains untouched. 3: You won’t have to pay any interest! The best thing about purchasing in cash is that the overall price can be negotiated way lower than a financed purchase. If a dealer gets a cash buyer, this means they don’t need to pay a lender any transaction fees for the purchase, and 100% of the profit goes straight to them. Because of a bigger profit margin, they’ll be more open to negotiation. My car was originally listed on Craigslist for $8,100, but because it had an airbag and seatbelt light on and needed a lot of cosmetic work, I was able to knock $800 off. Sidenote #1: I ran the VIN number and found that there was a minor safety recall for the airbag and seatbelts so I had it fixed at my local BMW dealership, free of charge. Sidenote #2: For those who haven’t shopped on Craigslist before, Craigslist.org is a free website that allows people to list items for sale and buy other people’s stuff – anything from furniture to cars. Even job openings can be listed! Within reason, you should always try to offer a lower price. Doing some research on the prospective car before meeting with the seller can help you can justify your offer price. What years or models have problems? How much does it cost to fix it? Is it just cosmetic or does it need heavy engine work? Is it clean title? Do you have the pink slip in-hand, or was it “left at home”? Does the pink slip match the seller’s name and driver’s license? Is the seller asking for a check or are they willing to pay in cash? Is the seller even present? If the seller claims recent repairs or maintenance have been done, do they have the receipts to prove it? During the test drive, did the car act problematic or differently from the seller’s proposed condition? Does the seller seem withholding? Could they possibly be hiding something about the car that you didn’t find upon your inspection? When in doubt, always document anything in relation to the sale. I make it a habit to take a picture of the seller’s driver’s license and request that they write up a Bill of Sale. I ask for any and all receipts of maintenance and repairs done to the car. Don’t ever take IOU’s or bank on empty promises, and don’t hand over any money unless you intend to walk away with the car and pink slip right then and there. We consider the miles on a car like its age. I purchased my car with about 111,000 miles already on it, so you could say it was probably at half-life. Some people laugh at anything over 100,000 miles, but if you’re able to find a car over 100k, sometimes it works out. It sounds completely opposite from what we’ve been taught, but hear me out: after every 100,000 miles worth of driving, a lot of things need to be changed out – your water pump, timing belt, drive belts, spark plugs, all need to be changed. Your valves will need to be adjusted, and regular maintenance is necessary on top of all of that, such as engine oil, transmission oil, and all other fluids. Even though my car was over 100k, the previous owner had all of the above already done to the vehicle before he sold it to me, and he had the receipts to prove it as well. I probably saved myself about $5,000 worth of maintenance work and (a bunch of headaches too). People will always laugh at others who buy cars at over 100,000 miles, but honestly, if you properly maintain a vehicle – any vehicle – it should last you 200-300,000 miles. A common misconception is that buying a brand-new car or one within recent years is a foolproof tactic to avoid problems. Generally, this is somewhat correct, but not always true. You can save money on getting older years and still walk away with a quality car, but it just depends on how well the car was maintained. Dealerships will charge an arm and a leg for newer cars, but since they buy in bulk, their pre-owned cars aren’t always thoroughly checked from head to toe. This also means they may have purchased a newer repossessed car from an auction that was neglected and poorly maintained from its previous owner (you don’t have to have years of ownership to screw up a car – being a bad driver and mess it up enough). So why pay a premium for the peace of mind that is really just an illusion? If you bring a mechanic with you to a private sale, they’ll be able to check out the car’s condition and tell you if it’s worth it. I’m lucky to have a boyfriend who is a race car driver and an automotive mechanic, so I have a little bit of knowledge when it comes to cars – but it wasn’t always like that. I had to learn. I had to learn how to change my own oil and how to change things like my bushings and front control arms (I actually bought a pair on eBay for only $200 and 50,000 miles after I installed them, they’re still doing great). I had to take out my headlights and dismantle them to polish off some major haze (dealerships charge hundreds of dollars for this work; it just took me a few hours and a couple of tools). The truth is, sports cars require a lot of maintenance, and car dealerships charge an arm and a leg for even minor services. It saves so much money if you learn how to maintain and fix your car on your own. I learned through watching my boyfriend work on his cars, and used Google to diagnose problems and Youtube to watch tutorials. If you have the time, it’s worth learning how to work on your car – that way, labor is free and you’ll only have to pay for parts. has a lot of the car parts I need for my BMW, so I tend to shop there. They also have parts for Porsche, Mercedes, Audi, Volkswagen and Volvo as well. It’s really important to be fully aware of the possible problems the car may have. Take the time to research online and see if certain years or models had similar problems, so that you know what to expect and when. How much is the vehicle worth according to Kelly Blue Book? How expensive are maintenance and parts? Is it a gas guzzler? Will your auto insurance skyrocket when you add this car to your policy? The biggest mistake buyers make is making an uneducated purchase; they wind up panicking when they realize they simply cannot afford the car in the long run. The purpose of purchasing a pre-owned vehicle is to save money, right? Be patient, since finding the right car for you may take some time. Unlike new vehicles, pre-owned cars are limited in inventory, and leaves you as a consumer with little options. If you’ve got your eyes set on a specific year, make and model, it will take longer to find a quality vehicle for you at the right price. A friend of mine wanted to buy a BMW, but was already committed to a specific year and model. Within the first week of his search, he went home with the car he wanted. However, a week later, he found the same car in better condition with less mileage, and about $2,000 less than the one he bought. Check that the VIN number on the car matches the same VIN on the pink slip. You can find the VIN number on a metal plate somewhere along the walls of the engine bay under the hood. You can usually find it on a white sticker on the driver’s side door jam, but knowing con artists out there, it’s better to check the VIN plate. Always bring a friend. Not only can it be dangerous to meet with a stranger alone, but a second set of eyes can help find things you may not be able to. You’ll be busy talking to the seller, asking questions, and test driving it. Even if your partner isn’t a mechanic, they can still see or hear things and point out what seems bad. A second opinion will help you make a rational decision. If there’s too many problems upfront, it may not be worth it. Unless you’re a mechanic or have a hobby in fixing cars, the vehicle may wind up giving you a headache rather than satisfaction. Of course, you can try to negotiate a lower price, but is that price worth the condition of the vehicle? If it doesn’t feel right, don’t do it. If you’re not ready to make the purchase, don’t do it. If the seller seems shady, don’t do it. Simple as that. My boyfriend and I have bought many cars on Craigslist using these methods, and they’ve proven to be tried and true. To this day, I drive my BMW with pride – I don’t just get from Point A to Point B. I truly enjoy the ride because I love how my car handles. I may not have gotten the same experience if I made a more “practical” purchase. I do not regret my purchase at all, and I don’t think I ever will. Not only do I love my BMW, but I’ve learned so much from working on it myself and have grown to appreciate every working mechanism of it. This knowledge is priceless as it’s helped me fix my parents’ cars and help friends with their cars as well. Have you purchased a pre-owned vehicle before? Tell us about your experience in the comments below! Liked this post? Subscribe to my newsletter below to receive more budgeting posts by email.